Thank you for the invitation and opportunity to share with you my thoughts, perceptions, opinions and recommendations (TPOR) on Governance of a Department of Surgery. I will be sharing my TPOR that are mainly derived from my being a Chief of the Division of the Surgical Oncology, Head and Neck, Thyroid, Breast, Skin and Soft Tissues and Esophago-Gastric Surgery (from 1991 to 2000); a Chairman of the Department of Surgery of Ospital ng Maynila Medical Center (from 2000 to 2009); and a lecturer on the Administration of a Department of Surgery for Master in Hospital Administration students (since 1993 up to present). I like to assume, correct me if I am wrong, that this topic on governance of a department of surgery is relevant to all of you, whether you are surgical residents or surgical consultants and whether you are members of the governing body or not. Governance is related to one of the competencies expected of us surgeons, that is, being a physician-manager or surgeon-manager aside from being a clinician, teacher, researcher, etc. Governance as a topic for discussion as well as for learning is relevant to you who are current members of the governing body of a department of surgery as you are constantly being faced with so many challenges in the roles you are now playing and as you continuously look for ways to be more effective and efficient. Governance as a topic for discussion as well as for learning is also relevant to you who are not current members of the governing body of a department of surgery and you who are surgical residents as you look forward to the day in which you will be called upon to be members of the governing body and as you try to understand what your governing body is now doing and what you have to do to cooperate and collaborate with them. Governance of a department of surgery is an extensive topic to discuss and to learn. For the purpose of the conference, what I will do is to give you an overview of governance of a department of surgery and then present for purpose of sharing three (3) projects that I established and developed when I was Chairman of the Department of Surgery of the Ospital ng Maynila Medical Center from 2001 to 2009 and which, I think, are still being done even after I officially retired from the hospital and department last January 31, 2014. The 3 projects were selected by the OMMC Organizing Committee for this conference. These are, namely: Medical Anecdotal Reports; Problem-based Learning Issues; and Indigent Patient Help Program. On that note, I end my introduction and will now go to first topic of my presentation: Overview of Governance of a Department of Surgery. I will use this diagram to give the overview of governance of a department of surgery. 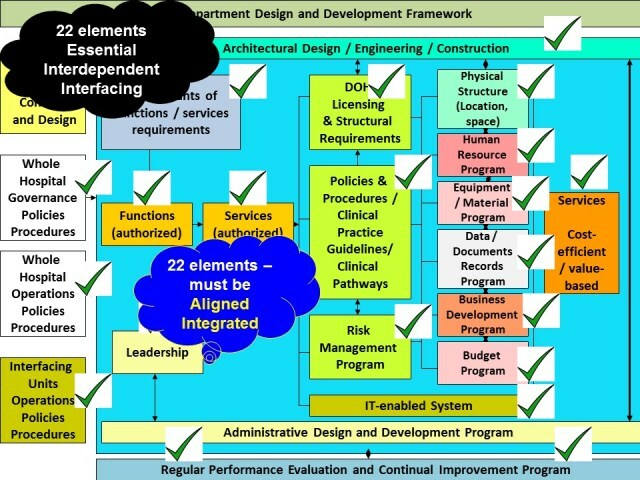 In the framework, which I name as Department Design and Development Framework or Administrative Design and Development Program, there are 22 elements, essential, interdependent, and interfacing elements which must be established, developed, aligned and integrated. This is the primary responsibility of the governing body or leadership. For each box, there must be documents, one, that contain the design and development blueprint; two, that contain evidence of implementation; and three, that contain evaluation results of implementation. In this slide, I just wanted to show the basic processes of management – the inputs, the outputs, and the throughputs and the evaluation and continual improvement. What I will do is to just to run through the 22 boxes with some brief remarks or pointers along the way. Functions which means the officially authorized functions of the department of surgery. These have to be clearly and completely spelled out and publicized. These will serve as the main steering wheel or compass for the department development as well as bases for interfacing with other departments in the hospital, and also for evaluation purpose. To provide quality health services to all patients needing management in the field of surgery (general surgery, colorectal surgery, pediatric surgery, urologic surgery, neurosurgery, plastic and reconstructive surgery, thoracocardiovascular surgery, and orthopedic surgery). To provide quality health promotion and disease prevention program in the field of surgery to clients in need of such service. To provide quality and safe diagnostic and therapeutic procedures to all patients with surgical problems. To provide quality and safe pre-operative, intra-operative, and post-operative surgical care to all patients in need of such health care service. To provide quality rehabilitative health programs in the field of surgery to all clients in need of such service. The next boxes in the input are services; determinants of functions and services; whole hospital concept and design; whole hospital governance policies and procedures; whole hospital operations policies and procedures; and interfacing units’ operations policies and procedures. In the output box is the service outputs (cost-efficient / value-based) which means the ultimate goals of the department of surgery in terms of service, which are generally and basically cost-effective or value-based services. In simpler terms: good health care delivery outcomes (good results) such as optimal surgical mortality and morbidity rates; success treatment rates; and quality and safe services with reasonable costs and expenses. 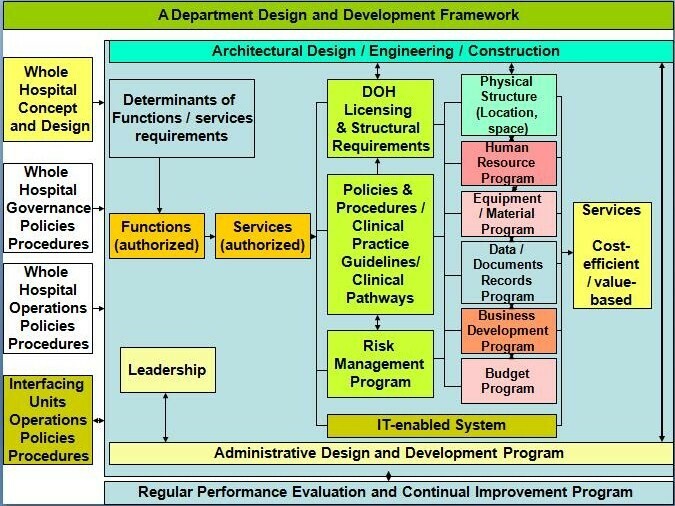 In the throughput, we have the DOH licensing and structural requirements; physical structure (location and space); equipment and material program; human resource program; policies and procedures / clinical practice guidelines / clinical pathways; data / documents / records program; risk management program; business development program; it-enabled system; budget program; architectural design / engineering / construction; regular performance evaluation and continual improvement program. RISK MANAGEMENT PROGRAM refers to a planned and systematic process or program to reduce and/or eliminate the probability of a “risk” that usually results in injuries, losses, and legal suits. BUSINESS DEVELOPMENT PROGRAM refers to a program that will develop the business of the department of surgery to make it viable and sustainable. REGULAR PERFORMANCE EVALUATION AND CONTINUAL IMPROVEMENT PROGRAM refers to appraising extent of accomplishment of the department of surgery in its authorized functions and business plans at planned intervals (quarterly, biannually, and annual) and to determine areas of improvement and to act on them. There you are, the 22 essential, interdependent and interfacing elements to establish, develop, align and integrate in the governance of a department of surgery. It will take years to fully develop all the 22 elements, at least 6 years perhaps on a full time basis. So, start now. 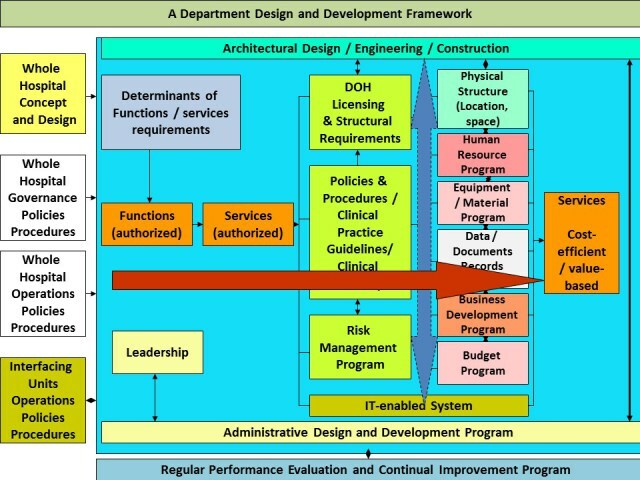 My specific recommendation is for all governing bodies of departments of surgery to use this Department Design and Development Framework or Administrative Design and Development Program as a guide and checklist. Once all the 22 elements are fully developed and aligned and integrated to each other and to the entire hospital system, chances are, the governance system of the department of surgery will be judged to be excellent. As I said in the beginning of my talk, governance of a department of surgery is an extensive topic to discuss and to learn. For the purpose of this conference, I declared that I will limit myself to just giving you an overview of governance of a department of surgery through the framework that I just presented. If you want to get more details, especially, on what and how I did it in the Department of Surgery of Ospital ng Maynila Medical Center from 2001 to 2009, when I was its Chairman, visit the following website (https://rojosonommcsurgeryfilesandnotes.wordpress.com/governance-2001-to-2009). Feel free to ask me questions either through email (rjoson2001@yahoo.com) or through my cellphone number (09188040304). This entry was posted in Governance of a Department of Surgery. Bookmark the permalink.